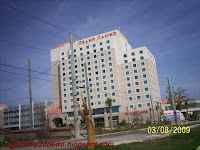 This is The Grand Casino in Biloxi, Mississippi, the caption of the picture is not really clean because I made it a point that the angle would see the damage on the left side. That is the present picture and this place is still moving progress to recovery from Hurricane Katrina. What you see at the middle is the carving of a bird out of a damage tree from that calamity.Instead of uprooting those historical trees, they make an art of it. 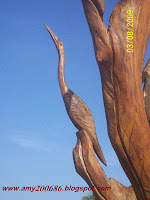 These carvings are visible on the long highway of Beach Boulevard area.